- Go when I say go, and I should not have to beg the horse to do it. This means he can instantly gallop out of his tracks and not walk or trot first. If he can do this he will be able to instantly walk or trot our of his tracks, and he will be much easier to collect. - Be soft in the nose. If he pushes into the bit he will shift his weight to the forehand, stiffen, and put himself into an out-of-balance position and be very hard to collect properly. But if my horse is developing what we call a “soft feel” he should drop his head and bring his nose in when I pick up the reins, not just because I spurred him or pulled on him. - Be soft in the hindquarters. Can he move his rear-end sideways with a small cue of the seat and legs while keeping his nose pointed forward and his neck soft and relaxed? If he can, it will be much easier to teach him lateral moves like side-pass and haunches-in, and also much easier to teach lead departures and lead changes. - Be soft and supple in his neck. If he is stiff in his neck he will be stiff in the body and feet and it will be difficult to control each individual foot at any given moment. - Back-up with energy and collection. The better he backs up the better he will do everything else. - Be able to bend the spine. This is impossible if there is stiffness in the neck, shoulders, hindquarters and feet. We also need to be sure we understand the body position needed for collection and to perform athletic maneuvers like these. For a horse to turn, stop, back up, change leads correctly and carry himself in a balanced, athletic position, he must be able to bring his back feet underneath his body toward his “center of mass”, which is the balance point between his nose and tail where you could balance him on a pedestal. He must be able to do this while moving forward, backward or sideways. This will raise his back and engage his hindquarters. Sometimes these things can be taught individually, and sometimes they can be taught in combination or during “on the job training”. For example, a horse can learn to be soft on his nose while he is learning to back up or turn, if the rider is skilled enough with the timing in their hands. And the horse can learn to improve its back-up and forward while working cattle in a pen. It is worth repeating some of the information I covered in the preceding article about how the feet move during turns. When a horse pivots on the outside back foot the horse is moving backward during the turn. And when the horse pivots on its inside back foot it is moving forward during the turn. A pivot foot is stationary by definition, but we can also think of it as the slowest foot in a circle, in which case the foot will actually be moving forward or backward. For example, a car has four wheels, just as a horse has four legs. When you turn your car to the right, you are moving forward and the car’s right rear wheel will be moving slower than the other wheels. This is the “pivot wheel”, and the sharper you turn the front wheels to the right the smaller the circle becomes that the right back wheel is making. If the turn is sharp enough the wheel will just be spinning in one place, but the car is still going forward in a small circle. Your horse works the same way. When your horse is moving forward and you ask it to turn right by moving its forehand to the right, it will be pivoting on its right back foot. This is its “pivot foot”, also called the “inside back foot”. This description perfectly describes what is going on with the back feet when a spin is done correctly. Turning while pivoting on the inside back foot. This exercise requires that the horse be able to collect itself in order to keep its weight from shifting to its front end during the turn, which would cause it to pivot on its center rather than on its inside back foot. A good way to start is to be sure the horse understands how to move away from pressure with its shoulders, is soft in the nose and will go forward instantly when asked. When turning, the horse’s shoulders must be able to move sideways while it travels forward. There’s no way around that. If the shoulders won’t yield sideways we have nothing. I usually begin teaching a horse to move away from pressure with its shoulders by first teaching it on the ground, using a game I refer to as the "tango game". (See photo 1 and 2) This game actually requires another full article to explain all the details. But if you are already familiar with this game its a good way to prepare the horse for learning to move its shoulders sideways. If you’re not yet familiar with it, I invite you to join me at a clinic where I teach it, along with several other good ground school games that prepare a horse for riding maneuvers. ​​This game simply teaches the horse to yield to rein and shoulder pressure by moving its shoulders away from the pressure. Since it puts the horse’s weight back on its hindquarters its important to understand that the horse will usually pivot on its outside hind foot during this ground-school game, and that’s OK. Once the horse has learned to yield its shoulders correctly, it is only a matter of transferring it to the riding position. When riding you will be moving the horse forward and asking for the shoulders to yield sideways, to create a turn with a pivot on the inside back foot. This can be easier said than done. what you want it to do. So, when asking for a right turn with a pivot on the right (inside) back foot, you will point with your right hand in the direction you want the horse to go, keeping your thumb down and your hand slightly lifted. Don’t point downward as you turn. ​​Your left hand should never cross over the center line of the horse, and your thumb should be up on that hand. Keep your left elbow pressed against your lower ribs and hip bone. I call this ground school exercise the “Tango Game” since it reminds me of dancing the Tango when I teach it. It is a direction change. My left hand is sending the horse’s front end back to the horse’s right, just as it would do in a roll-back in reining or in working cows. My right hand is supporting the movement by driving the horse from the opposite side, just as the supporting rein and leg would do when riding. Notice that the horse gets instant release from rein pressure the instant it starts the direction change. Your feet should do what your hands do – when your right hand is pointing where you’re going, then take your right foot slightly off the horse in the direction you are pointing. Your left elbow will be against your body and your left hand will be up against the center line of the horse, with thumb up, creating slight rein pressure on the left side of the horse’s neck. This is called the “supporting rein” or “driving rein” and will eventually become a “neck rein” when the horse learns to simply move away from that rein pressure. (See photo 3) Your hips will be tilted slightly to the left as you ride forward. All of this creates a situation where you are “driving” the shoulders away from pressure, creating the turn. ​​Its important to take a moment to discuss in a little more detail the function of a direct rein and the rider’s outside leg in regard to how they communicate with the front feet during a turn. For instance, if you are turning right, then the right rein will be the direct rein – I often call this the “sending” rein because you use it to send the right front foot to the right. When using the rein this way, you will apply pressure to the rein with your right hand, with your thumb down, while you simultaneously apply pressure with your outside (left) leg. The rider’s slight outside leg pressure is the cue for the horse to turn, and is actually applied just before the direct rein is applied. In other words, the rein reinforces the primary cue with the leg. All this is done while the rider’s pelvis and body are in the position described above. As the horse raises its right front foot to begin moving it to the right, you need to release the pressure the instant the right foot comes off the ground and allow the foot to travel on its own to the right. (See photo 4) You also need to release the pressure with your left leg when the turn is complete. Never lean into the turn and/or drag the horse through the turn. This will usually push the hindquarters to the outside and cause the horse to turn on its center like a bottle. Also, never lean backward during a turn. This takes the forward energy out of the horse and can cause the horse to turn like a bottle or pivot on the outside back foot. ​​Many well bred horses with good conformation have learned to turn correctly in spite of the fact that their rider leans back and/or leans into the turn. This is usually because they have been “corrected” for doing it wrong, even though the way the rider asked probably caused them to do it wrong in the first place – not because the rider made it easier for them to understand how to turn correctly. There is an old saying: “The worse the conformation of the horse and the more bad habits it has, the better the trainer must be to get it to do the right thing”. There is another old saying in the show circuit in the U.S. that says: “Great horses make ‘great’ trainers”. In other words, great quality horses are easy to train if you are a good trainer, and even if you are a not-so-good trainer they’ll make you look better than you really are because they’ll probably do it right much of the time even when you do it wrong – because they’re built correctly so its easier for them. But, any good quality horse can be ruined by a bad rider. Horses that have become insensitive in their nose and sides and don’t yield to pressure well in those areas will usually try to dump their weight forward when you ask them to turn. If they try this you will need to block them from dumping their weight forward by bringing in their nose and shifting their weight backward onto their hindquarters, then following through with the turn. This will collect them, taking their weight off their front ends and making it easier to move their shoulders sideways. It will cause the pivot foot to shift to the outside, but its more important to reinforce the cue to move their shoulders sideways rather than let them push into your hands and dump their weight forward and start thinking that’s acceptable, its not. When blocking a horse who is dumping its weight forward during a turn, you can lift the supporting rein and apply pressure to shift the horse back a little to lighten the front while you send the horse sideways with the direct rein. The difficulty for a lot of people will be feeling when the horse is about to shift its weight forward, and then blocking that shift with the reins and seat at the right moment, before the horse has a chance to do an incorrect turn on its center. Many horses will just blow right through your correction because they’re hard in the nose and shoulders and don’t respect the cues. Working separately on developing a good back-up will really help sensitize the horse in these areas. And many people can’t see or feel, or just don’t notice, when a horse moves its rear-end sideways when the rider actually had asked for the front-end to move sideways. Sometimes I will put a student on a well trained horse that knows how to move its front quarters sideways and also move its hindquarters sideways. I tell the student to close their eyes while I signal the horse to move each end sideways, and then ask the student to tell me when they feel the front move or the rear-end move. Nearly a third of the riders can’t tell the difference. Most can feel when the horse is going forward or backward, but sideways movement of the front or rear of the horse confuses them. ​When all of these components come together in the right balance, we will have a horse that is moving forward while turning and pivoting on the inside back foot. In a right turn, for example, the left front foot will be crossing in front of the right front foot during the turn. The nose will be soft and the shoulders will be following the nose through the turn (See photo 5) – all this while walking forward in a circle with the inside back foot being the slowest moving foot, causing it to be the “pivot foot”. If a turn is sharp enough, and if you keep turning, it will actually be a spin. As the horse gets better and quicker at responding to the cues it will begin to move off the supporting rein and supporting leg. It is on its way to becoming a neck-reined horse. 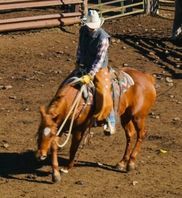 During the transition period between learning the basics of the turn and becoming a neck-reined horse, I use a technique called “squaw reining” in which I use only one hand to turn the horse. (See photos 6 and 7) In this technique I am using the fingers of my right hand to apply the sending signal, and the left rein applies the supporting cue. Its important that the right rein be slightly shorter than the left rein during this turn. ​This exercise can be difficult to teach to some horses, and easy for others, it all depends on what kind of undesirable habits you are trying to overcome in your horse and possibly in yourself. It also depends on the conformation of the horse to some extent and the skill of the rider to a great extent. There are a lot of exercises that can be done in advance that can make turning while pivoting on the inside back foot easier. These will have to be addressed in future articles or at a clinic. I encourage you to join me at a clinic to get some individual help with this if you run into difficulty. In this photo you can see that your feet do what your hands do. When turning to the right, your pelvis, left leg and left rein will be driving the horse to the right. Your right hand will be sending the right front foot to the right and slightly back since a turn is actually a small portion of a circle. Thumb down on the right hand, thumb up on the left hand. Look where you’re going and don’t cross over with your left hand. Its easy to see here that the right rein is sending the right front foot to the right. The right front foot has just left the ground. I am using slight left leg pressure and also slight left rein pressure against the neck without crossing over with my left hand. During this right turn you can see that the left front foot is crossing over the right front foot since the horse is moving forward. In these photos I am “Squaw Reining” this mare. This is an old name for a technique of using one hand, but still handling the reins as though I were using two hands. I send the horse with my fingers rather than my hand and arm, and the supporting rein starts to become a cue for her to turn. This is the intermediate stage of creating a “Neck Reined” horse. In Photo 7 she is traveling forward and about to put her weight on her left back foot (her pivot foot), and then step around it with her right back foot.